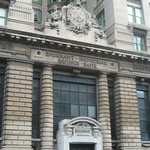 A savings bank expressly for Irish immigrants, the Emigrant Bank grew out of the Irish community's long tradition of assistance to newcomers.The Irish Emigrant Society of New York, founded in 1841 by members of the Friendly Sons and backed by the Catholic clergy, lasted in the City until 1936. Its purpose was to protect against and remedy the shipboard conditions their emigrating compatriots had to endure; to protect them against swindlers who found it easy to bamboozle and steal from the newly arrived greenhorns; and then to find them jobs. 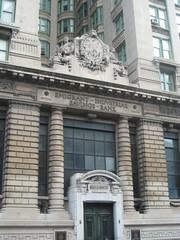 The bank provided, along with standard services, free remittance of money home to Ireland or Britain, where great numbers of Irish continued to immigrate. The remittances were most often used to pay the rent and the debts run up in the shops. The cost of steamship tickets to America was covered by prepaid tickets. Friends or family members in America purchased the tickets from passenger brokers and sent them on. Large sums were involved: during the second half of the century, a staggering one hundred million dollars is thought to have been paid out for such tickets.